& now it's time to share Michelle & Craig's bright, cheerful, intimate, summer wedding! YAY! I just love how simple & beautiful all of their details were - they fit their personalities perfectly! These two love taking hikes together & being outside - thus the beautiful wild flowers, photos in a big field, outdoor ceremony, & all around relaxed vibe of their day. & it also explains why they promptly packed up after their honeymoon & moved to Colorado. haha I enjoyed every minute of this sweet wedding - I hope you enjoy the images we were able to capture too! Craig, in all of his many talents, made this ring box! SO special! I love doing first looks with my couples - I mean look at these reactions! It's so special because it's just the two of them (as well as me & my assistant tucked away from them a bit) in a quiet spot where they can see each other for the first time on their wedding day & spend a few minutes loving on each other & sharing in the excitement of their day. When my assistant & I were driving Michelle to the park to meet up with Craig she could hardly contain her excitement - she said their first look is the thing she has been looking forward to the most! I'm so glad it was so exciting for them & that they were able to get some quiet time together before the craziness of being around people all day & moving from one thing to the next. How about the amazing color of these bridesmaids dresses?! POW! ...the sky looked so awesome after that storm too! They seem like a milk & cookies kinda couple, right? & boy were those some good cookies too! They have a fun family tradition at the Lake of the Ozarks every 4th of July - it's a big parade & each family has a theme they always use - so, since Craig & Michelle always do a patriotic theme everyone put on a surprise patriotic parade at their reception just for them - it was a pretty fun bonus! This was such a sweet & special wedding for me to be a part of! Sandy & Jojo got engaged a few years ago & had me do some engagement photos for them, but also told me that they were going to wait about 3 years to get married. I have to admit, I had so much fun doing their engagement session that I was kinda bummed that their wedding would be so far away...but alas, they decided they could't wait any longer (which of course, made me squeal a little with excitement when she told me they were getting married in November!). Sandy wanted everything to be classic & beautiful with lots of pearls, diamonds, & lace - kind of a modern take on a classic Audrey Hepburn...she succeeded! 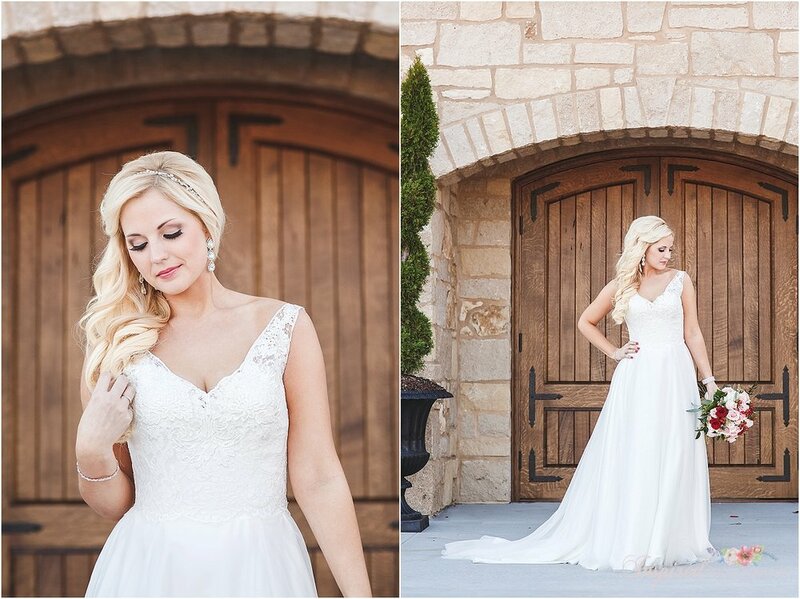 There were so many beautiful details throughout their day that fit her description perfectly! These two are so adorable & so in love with each other. You could really tell how wonderfully supported they were by all of the family & friends that surrounded them on this special day too. What a wonderful treasure of strong, deep, sweet love God has blessed them with! They created their own awesome little photo booth with some balloons, face props, & a tablet with the camera set to a timer...such a fun & easy way to capture all of your guests having fun being goofy! I'm excited to finally be sharing this gorgeous Innsbrook Wedding with you! I love when all the girls can be a part of the bride getting ready - such a special & perfect way to start the day. I mean, just look at Maggie beaming with all her closest girls surrounding her with excitement. mmmmmm...their first look was so sweet. This wedding party was so fun! Thanks again for allowing us to capture this perfect & memorable day for you Maggie & Ryan! We loved every minute of it! I am so happy to be sharing this beautiful & spunky summer wedding with you today! Do you remember Stephanie & Andrew's Engagement photos? These two are so sweet & fun together - when they look at each other, you can tell how much love & affection they share - I knew their wedding would be a perfect representation of their fun-loving spirits! I love this one of them alone in the chapel...so sweet & peaceful. Prayer works people! That rain stopped just long enough for all of their fun wedding party portraits & came right back during the reception after everyone arrived. Thank you Jesus! That rain really did us some good...the colors were all so rich & beautiful for their photos! Congratulations again Stephanie & Andrew! !